Torque News recently tested the $33,465 Subaru Limited and $ 33,699 RAV4 XLE AWD back to back. Here is our report on how the two compare when driven. For a full comparison of the two please see our additional story titled, "2019 Subaru Forester Limited vs. Toyota RAV4 XLE – We Compare and Contrast Two Popular Crossovers"
If you are judging these new generation crossovers by having driven older versions of these crossovers you are making a big mistake. The Subaru Forester Limited and Toyota RAV4 XLE AWD both handle better than their past generations. The Forester feels the most competent in corners in our subjective opinion. However, both are fun to drive in this regard. We would say that the CR-V from Honda and Mazda CX-5 are their equals, so shoppers who want a crossover with good handling have a lot of choices in this segment. Both the Forester and the RAV4 have great comfort over broken up New England spring roads. The XLE RAV4 we tested had the standard 17” wheels with “regular profile” tires. We cannot comment on how the 19” low profile tires handle bumps. The Forester we drove did have the larger diameter wheels, but was still very compliant over rough road surfaces. This one is a tie. The prior generation Forester (ending in 2018) has a mushy brake pedal with more travel than most people like. The new one is perfectly fine. So too is the RAV4. Both have good brake feel and do not stray from the mainstream in this regard. Although the RAV4 has more peak horsepower, the Forester feels stronger in normal driving. It could be due to the nearly equal torque the two have. The Forester feels stronger in the low RPM ranges where we all do most of our driving. We also prefer the Forester’s smooth CVT. If you “hate CVTs” and have driven one for a while, we respect your opinion. However, if you have come to that conclusion without owning a modern vehicle with a new-generation CVT you are not basing your opinion on today’s reality. The RAV4’s 8-speed transmission never stops shifting. And shifting. And shifting. Why? 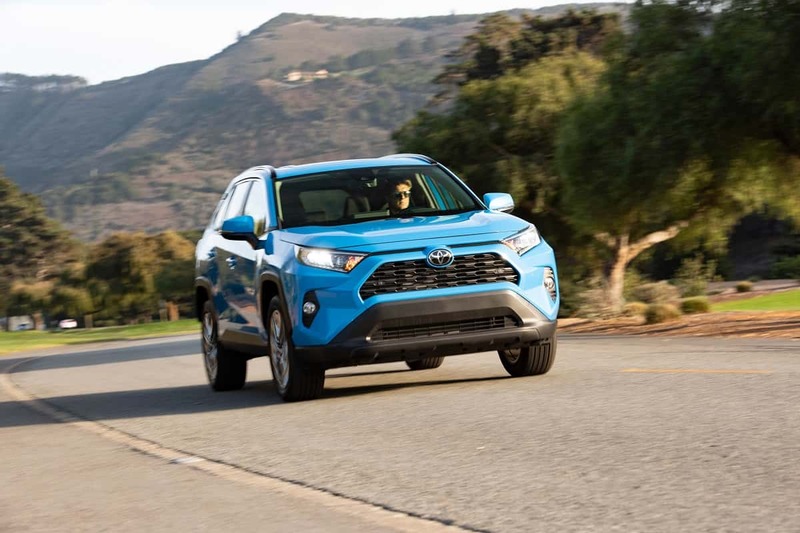 The top-trim RAV4 Hybrid uses a CVT, so it is not like Toyota is making a stand with old-school geared transmissions for some drivability reason. 2019 Subaru Forester Limited vs. Toyota RAV4 XLE – What About Off-Roading? The Subaru Forester has built a much-deserved reputation as the best crossover model off-road. With its 8.7-inches of minimum (not maximum) ground clearance, and dual X-Mode traction system, it is amazing based on our thorough testing. However, the new RAV4 adds its own new capabilities. Starting with more ground clearance compared to its prior generation. Now the RAV4 XLE has 8.4 inches of minimum ground clearance. Trims with the 19” wheels have 8.6 inches. That is a match for the Subaru. The RAV4 also has multiple drive modes for mud, snow and other conditions. We have not yet tested the new RAV4 off-road, but unless you plan to make off-roading a frequent part of your driving we are sure it will handle all roads and all weather conditions very well. Both the Subaru Forester and Toyota RAV4 are fun to drive and handle bumps well. We found the Forester to have a slightly greater sensation of power and torque in the type of driving most people do in these vehicles. Off-road the Forester is proven. The RAV4 is no slouch, and adds new capabilities. We suggest shoppers considering a RAV4 XLE AWD or Forester Limited take a very long test drive in each to determine which they prefer. There is no wrong choice in this matchup.